Had a bolt puncture through my A-Spec tire (what are the odds?). Anyway was wondering if anyone here has either gotten the spare tire kit or gone another option. I was thinking of just ordering a proper size steel wheel if thats possible (due to the large rim size) along with the cheapest proper size tire I can find to keep as a spare. The crazy thing is the dealership had no tires in stock to replace it with or any other dealers nearby that had one (I thought this would be a normal stock item). Anyway it's going to take another day for them to get the new tire and mount it so a spare would have been really nice to have either in the trunk or in the garage so I could drive the car the past two days. Luckily it happened close to home so even though losing air it was no problem getting it back home. Having a spare would be nice. I did have the tire/rim insurance so that's a plus. I never buy that stuff but did for some reason on this car. I could do the research but if someone has already gone that route it would be helpful. Thanks. Last edited by jhb31; 04-03-2018 at 04:17 PM. 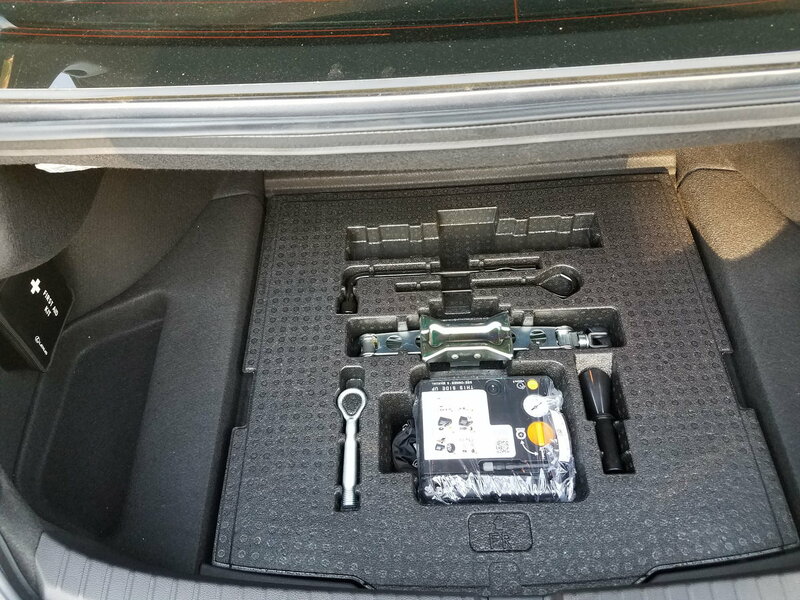 Just get the proper spare kit for your car - It comes with the proper insert, tools etc, and fits nicely in the trunk. You cannot fit a full size "spare" in there. Does the kit come with the tire, or is that a separate purchase? If not, I imagine Discount or America's tire would be able to source one for cheap. Ok, that's helpful. 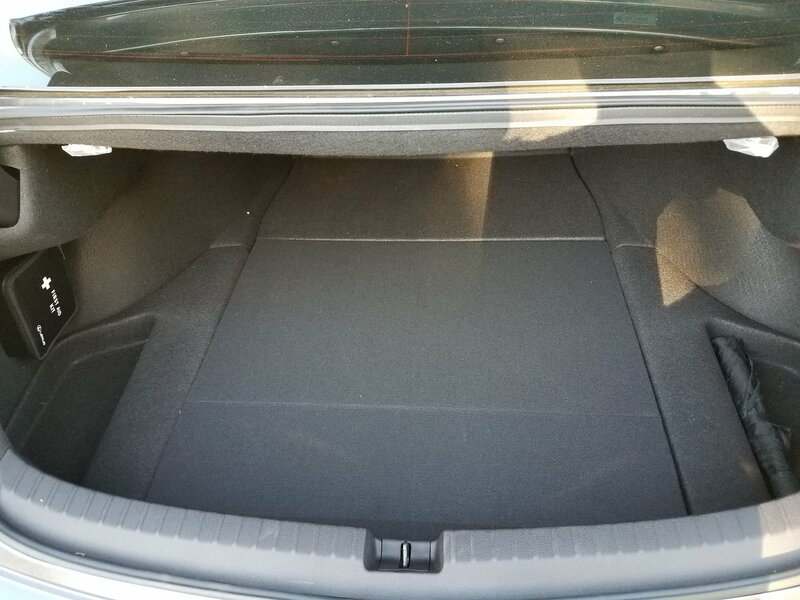 I didn't want to dig down through the stuff in my trunk to measure. Shame it will not hold a full size spare. Any idea what the spare tire is rated for mileage wise? Some are like 50 miles and if on a trip that's not enough but better than zero. I think it's around $500+/- for the kit but I may be wrong. For that it should certainly come with the tire. A factory rim and tire is approx $800 (per the dealer selling the tire/rim insurance) so the spare tire kit is no bargain. Only the second tire issue I have had in ten years but the way the roads are here with potholes all over it's likely to be a problem. I assume the kit comes with a jack of some sort so there is that. I have a new TLX A-Spec. I ordered the "Spare Tire Kit" to replace the pump/sealant kit that comes with the car. 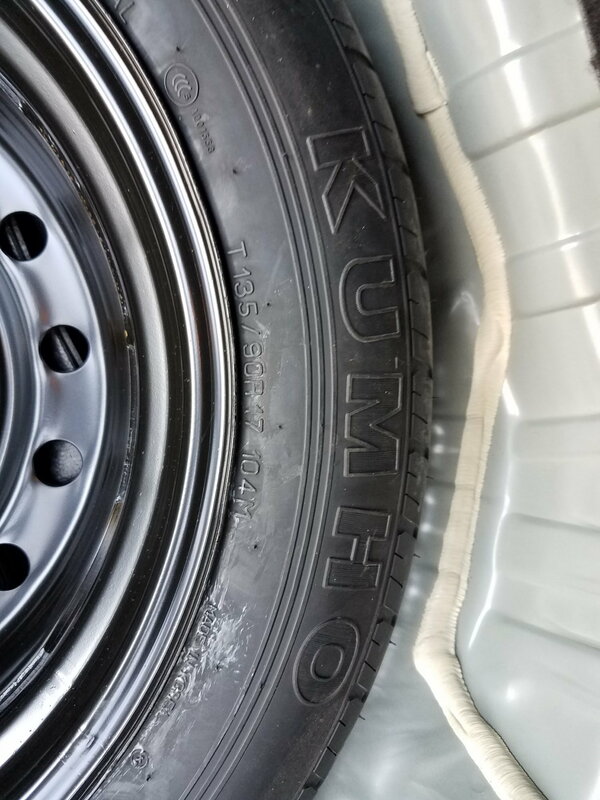 The tire is a doughnut style that's been around for many years. BUT...it DOES NOT COME WITH THE KIT! It has to be ordered separately...and it comes from a 3rd party vendor. So, armed with the doughnut tire size you could pick one up, generally, from most tire stores. If ordered from your Dealer...they are often back ordered. I lucked out and the Parts Dept. had one that someone never picked up, so I grabbed it. The "kit" came in the next day after ordering. I don't know the MSRP for it all. 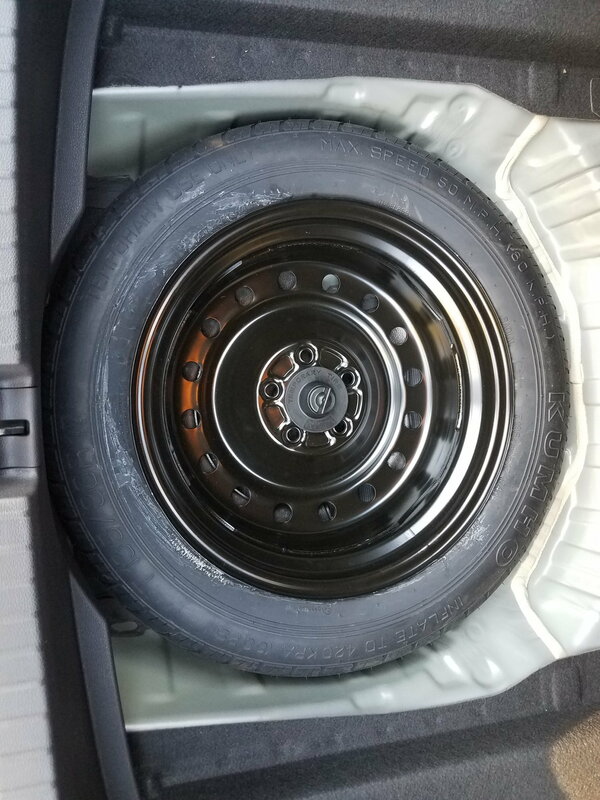 I worked a discount deal along with buying my car, so my cost for the "Spare Tire Kit" and the doughnut tire was $305.59 plus labor to mount the tire and put kit together in to the trunk. I kept the pump/sealant kit that came with the car. After all I did pay for it! Doubt if it will ever get used, but, never say never. A spare tire kit for a Mustang, when ordering the car, as an option, is just over $400. Pretty sad when we have to pay for spare tires. Those sealant kits are not 100% depending on what "kind" of flat you get. So, to me they are not something to trust, esp. if you are out in the boondocks somewhere. Dangerous. 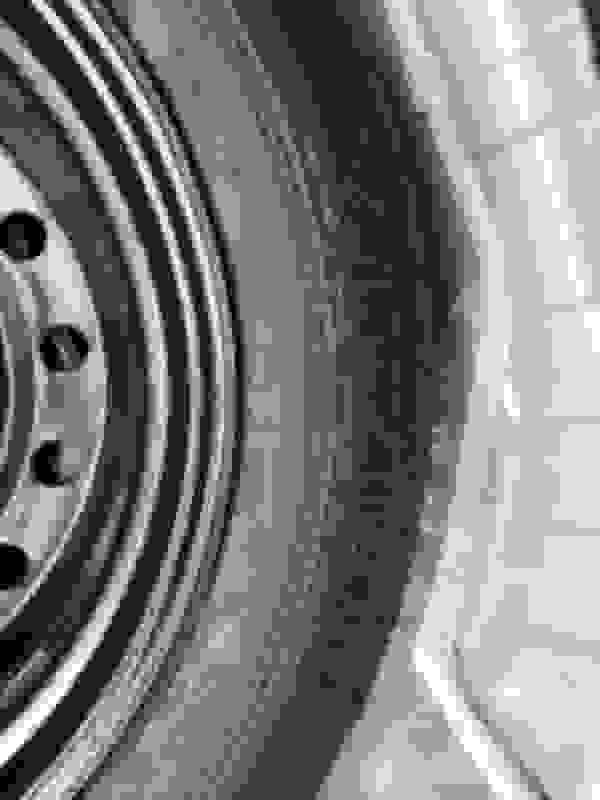 Tire is a separate order and it comes from a 3rd party vendor, often back ordered at dealers. So, most tire stores would have it....possibly. BTW, most Acura parts websites have this for approximately $190-$210 + tax & shipping. I would anticipate spending another $100 + mount & balance for the tire. Thanks, all helpful. Bill was $280 covered under the insurance but with tax here it would have been $300 without insurance. Stock tires are not much cheaper online $220 from my research. For $197 you can get Extreme Contact DWS 06 from DTD without any tax and then get the mounting and balancing done later. That's my route if I have the car long enough to replace the tires. Not even sure I would go with those at that price but seems like a better tire for less. 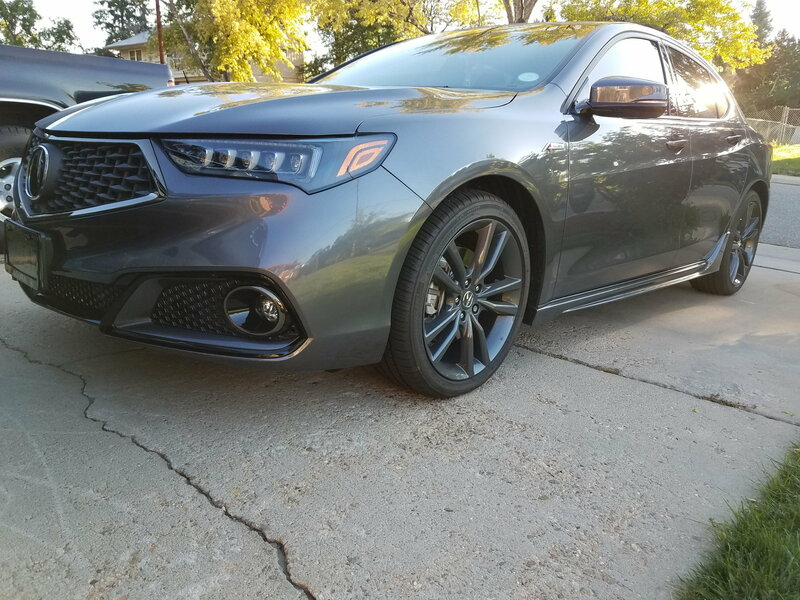 i brought a brand new 2019 Acura TLX and noticed that it doesn;t come with spare tire. Grrrr....i cannot believe that it doesn;t come with it. how dumb! also, you know what i noticed. this wheel doesn;t come with lock nut lock too. sighs. i am looking at two website to see if i will plan to order spare tires. Not easy finding one; good luck! yes you lucky! at the dealership they never told me. i though every cars come with spare tires. sighs! i wish they told me upfront so that way i can negotiated them about spare tire and wheel locks. my car already came with all season mat. what do you mean tire insurance? tire insurance come from your insurance or dealership insurance? i will call them and see if they can give me a good price for spare tires. I called dealer about spare tires. the dealer told me that most of their guests are fine with it not having a spare tire because of their complimentary roadside assistance. when i heard from them and puzzled. i was like OK then look up the website and forum. "Acura ownership extends well beyond their acclaimed, 4 years/50,000 miles limited warrently, it also includes total luxury care. - Acura | Owners Assistance - Roadside Assistance| m.acura.com. sighs...too much problems for me. bad luck this years. =( review from people comments about acura roadside assistance and seem negative about acura roadside assistance. CPR - interesting that your dealer gave you insurance mandatory for $8/month for 36 months. $288 dollars for three years. what will happens after three years? i will go ahead order spare tire and tools. I called dealer about spare tires. the dealer told me that most of their guests are fine with it not having a spare tire because of their complimentary roadside assistance. when i heard from them and puzzled. i was like OK then look up the website and forum. "Acura ownership extends well beyond their acclaimed, 4 years/50,000 miles limited warrently, it also includes total luxury care. - Acura Owners Assistance - Roadside Assistance m.acura.com. sighs...too much problems for me. bad luck this years. =( review from people comments about acura roadside assistance and seem negative about acura roadside assistance. CPR - interesting that your dealer gave you insurance mandatory for $8/month for 36 months. $288 dollars for three years. what will happens after three years? If you buy Continental tires, like the dws-06, it comes with Continental Total Confidence, which includes 3 years of roadside assistance, including towing if you don't have a spare. A word to the wise: BUY A SPARE TIRE! RIGHT! i hear you loud and clear. that why i am going to buy a spare tire no matter what. I can do it replace spare tire less than 10 min. Roadside assistance how long? who know forever. no way!!! Thanks! i will look up. i still need the tools to jack up the car and remove wheel nuts and replace spare tire. that why i have to buy a spare tire. sighs too much headache! I got rid of the 03 for an 05. But I got the dws-06 in 245/35-19. Not sure about spare size. Good thinking! think outside of the box! Most guest are fine with no spare because most guests do not know there is no spare. Total BS from Acura. One day someone will,be stranded and hurt not knowing they did not have a spare and hope they sue th crap out of the car maker. With all the damn safety tests the IIHS does they should list a spare as a requirement for Top Safety Pick +. 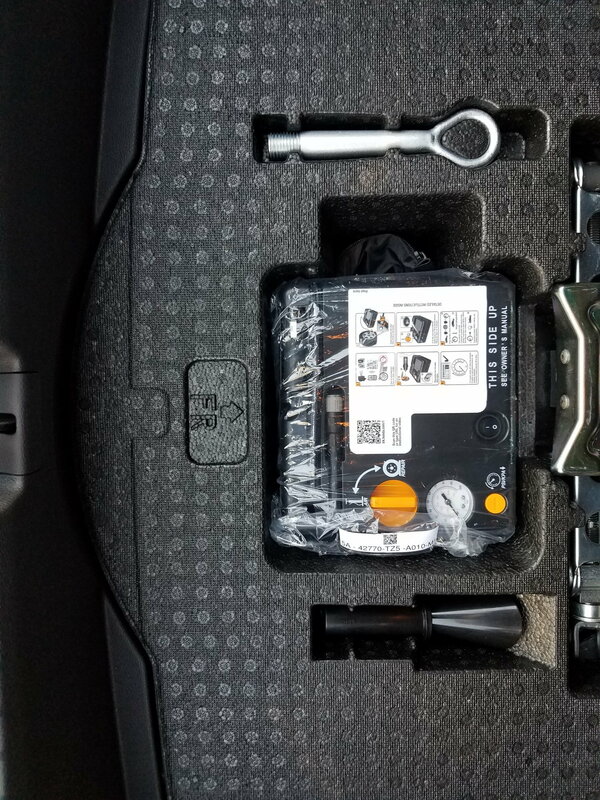 Has anyone "installed" the Spare Tire Kit into their TLX on their own? Is it just pop-in or is there actual installation work that has to take place? Also does it require any special tools? Thanks for any info. NO WAY!! for real?? thats crazy. do you have a picture of your spare tire and trunk? I do remember in my head that when i saw spare tire rim size is 17x4T DOT 12 19 17 something like that. 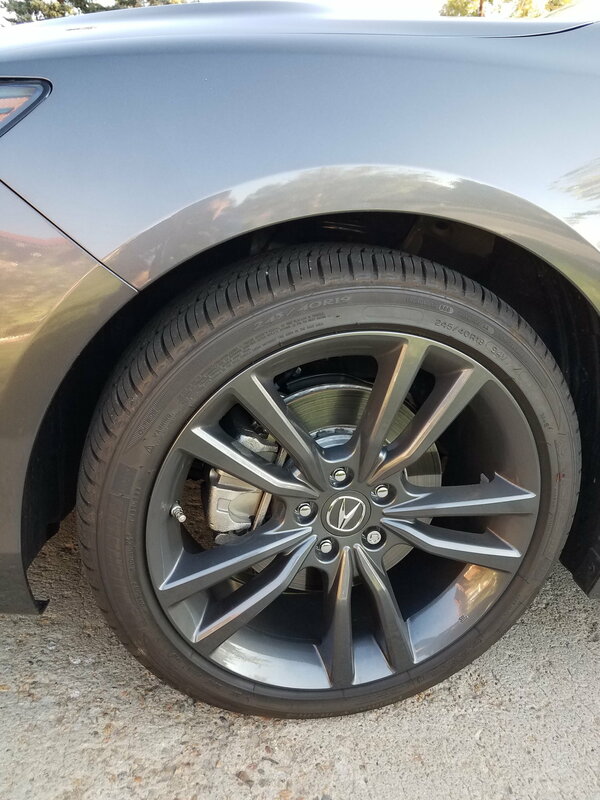 Remember, i have 2019 TLX A-SPEC 19inc wheels. I will take a picture tonight and post online to show everyone who are interest to get a spare tire. Anyway, the tire, & kit are installed, & all is well. Spare tire? or no spare tire?